I need a mayo with the right balanced taste that fits my budget so I can serve the best tasting burgers to my diners. 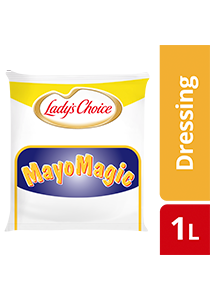 Lady's Choice Mayo Magic is a mayo specially formulated for burgers with a taste diners will love. Soybean Oil, Sugar, Permitted Modified Starch, Egg, Vinegar, Iodized Salt, Permitted Edible Gum, Permitted Preservative, Permitted Flavouring (Contains Mustard), Permitted Calcium Disodium EDTA, Spice. All additives are of plant and synthetic origin. May contains traces of celery. Lady’s Choice Mayo Magic is designed to deliver superior results for high heat cooking techniques such as grilling, stir-frying, deep frying and baking. It retains its good stability without oil separation even when heated up to 200℃ maintaining the consistent taste, color and texture after heating. It is the chef’s choice for hot applications! From the makers of Malaysia's Most Preferred Mayonnaise Brand. Can withstand heat up to 200℃.